Victoria Stilwell is a bully. This is a link to that post along with a screenshot I took in case the post is removed. “Lots of comments, opinion and controversy about the now-removed video of a baby ‘playing’ with an incredibly restrained and amazingly docile Mastiff. First of all, it is really sad that so many people crossed the line in their comments to the owner, and I apologize for my role in not encouraging enough restraint amongst those who mobilized to spread the word about the dangers of not fully understanding or being able to read canine body language – especially when kids are around. My intent was to try to shine a bright light on what I feel are incredibly dangerous choices made by dog-owning parents all over the world countless times each day, but unfortunately it devolved into something that included truly nasty online bullying, and for that I’m sorry. The concerning thing demonstrated by a lot of those who were sidetracked by the personal attacks, however, is that there is such a worryingly widespread misunderstanding and level of ignorance about dog behavior, body language, calming and appease signals, deference behavior and more. Such ignorance is understandable, because I’ve dedicated my life and countless years to being able to study and better understand it and I can tell you it can be difficult, especially for those just beginning to understand the depth of that which they don’t truly understand. A lot of people commented saying that they saw nothing concerning or dangerous about the video, and that is a devastating reminder that there is still so much work to be done to educate the public about dog behavior and safe dog handling practices. Seemingly simple-to-understand things like tail wagging, licking peanut butter off faces, and rolling over to show tummies (to name just a few) sometimes mean something completely different, and tragically it’s usually too late once someone learns this info the hard way. As a dog trainer who has dedicated my life to understanding and reading dog behavior and language as well as increasing education and awareness to reduce dog bites, I always caution that I prefer not to pronounce judgment on a case until I’ve had a chance to visit the environment, learn the history and meet the dog in person. But that doesn’t mean that I have to be somewhere to know that certain behaviors are unsafe in any environment, no matter how restrained and amazing a given dog may be. I’ve just spent several days personally assessing and dealing with the aftermath of yet another child who has been mauled to death by a family dog, and when I see the potential for similar disaster mislabeled as ‘precious’ and ‘cute’, I just about go crazy. My primary goal in situations like this is to prevent horrible things from happening to kids exactly like the child in this video. I know this poster feels like he knows his dog’s limits, but he would just be the latest in a long line of people who said ‘but I never believed my dog could’ve done that.’ Trust me, dogs are still animals, and they all have the ability to do things we could never imagine. Nowhere in her post does she apologize for her words. I decide to reply to her. She did remove the post but as you can see from my earlier link it’s not really deleted. She banned me from her Facebook page and deleted all of my posts. I went to twitter and sent her a message. This is that exchange. Her only response to my request for an apology about the words she used in her post was “Already did. But still haven’t heard you take responsibility for a misguided & dangerous (not cute) situation with dog & baby. And just like on Facebook she has blocked me from posting to her Twitter account. Notice that in all of her responses to me she says nothing about how the language she used instigated the entire ordeal. I’m a 40 year old man and I can handle all the hate mail but what would have happened if it was an older brother or sister that uploaded the video? Can you imagine the damage that would have been done to them emotionally? Finally I won’t be posting a copy of the video here as I see no need. The video isn’t the problem. The problem is that people don’t think about the fact there is another human on the other side of the screen when they make a comment on the internet. 13 Responses to Victoria Stilwell is a bully. I’m so sorry to hear what you went through. I wrote to her, and also to Animal Planet. Her post about her childhood bullying only serves to manipulate public opinion, to deflect from her own culpability in the attacks on your family. I have to wonder if her communication skills in this situation explain why she works at controlling dogs. I hope you know yourself better than to allow her foolishness to get you down, but I imagine it has caused you emotional distress. I strongly encourage you to speak with a lawyer. Grounds for intentional infliction of emotional distress seem might strong, imho. This woman needs to get a life. A responsible dog owner knows their dog and its limits. 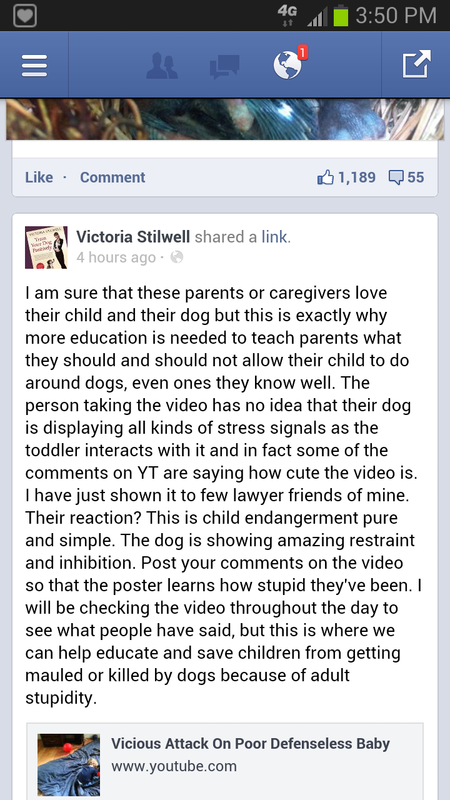 She has evidently never seen your dog other than a video and yet she thinks she has the right to pass judgement. What are we suppose to do be like people I have run into who tell their children ” don’t get near that dog it will bite you” when they have never met the dog or owner. I have worked in the past with the therapy dog program and I have seen “mean dog breeds” lay in hospital beds with children they just met and have their ears, tails, aand hair pulled and never do anything but lay there. You know your dog. Let your child play with the dog otherwise they will be afraid and that causes more bites than playing. I know this has been rather long but she pissed me off. We have always had dogs at my house. None of my childern have ever been hurt by a dog. But they have been hurt by people. I’m sorry this happened to you and your family. But remember even “experts” can be stupid annd this one seems to be searching for some thing to be wrong at all times. I agree – this lady needs to get a life. Why don’t you take up a cause such as children being bullied in school or something that needs to be addressed. I’ve had many dogs and never had one bite anyone so you need to mind your own business and let this family take care of their dog and child as they see fit. Julie C.
ChrisH is correct with the legal jargon. Besides that, do these people have NOTHING better to do than to criticize others? Methinks they need a hobby. That’s not me bashing them or anything. It’s simple advice: until your life is perfect, don’t give your peers hell because theirs might not fit your (pretend) mold. Jean: That’s not quite true. There’s a ton of well meaning owners who don’t know their dogs nearly as well as they think they do, which is how most bites and attacks happen. Kids, especially young kids are the most at risk. As disgusted as I am with Victoria at the moment, that piece is valid. As for actually educating people? Great! The thing is that, -that has nothing to do with what happened -here-. It wasn’t a private facebook or youtube message about her concerns, with a helpful link re: dog behavior. No give and take conversation with examples. This was online bullying via a mob and the farthest thing from education possible. Mr. Fuller was civil when he came to her page, but was still banned and deleted. Wyatt: You know where I stand. It was stupid, counter-productive, and generally makes me feel ill.
—-The video isn’t the problem. The problem is that people don’t think about the fact there is another human on the other side of the screen when they make a comment on the internet.— <– That and that. Lastly? What happened was about them and their emotional satisfaction, not education or the welfare of the child they claim to be motivated by. That's almost the saddest part. I hope things get better for you and your family. I think tf prople minded there own business and stayed out of everyone elses. If u want to get involved feed some of the children that dont have food. Or foster animals or something. Leave good people alone. I think you have a valid legal complaint and people who are professionals who use their profession as a base to make unsolicited judgments have a legal obligation to act with caution when posting things like she did. Legally, she would have had to ask your permission to post something to her show before she did, and seeing as how your video generated profitable traffic for her, you would have a possible valid legal suit against her actions, should you choose to pursue such an avenue. Judge Judy anyone? Donny: That’d be a far, far better use of their time, yes. Directed at me? If it is, please explain why you think that. Unlike others I won’t delete negative comments towards me. She meant Victoria. I thought it was directed at you, until I saw the facebook post she’d made. She was not impressed with Victoria’s idea of education.